The dissemination of underwater activities was mainly due to the U.S.S. and to its dynamic President, Ferraro: the social journal "Sport Subacqueo", released in 1948, was the first example of a brochure related to underwater issues. On the fourth and last page it bore the first advertising insert that was ever produced in connection with underwater issues. This advertising space was purchased by A.E.Cressi, the first manufacturer in the world to offer licensed "spearguns and underwater glasses", diver and scuba diver equipment, and "all accessories needed to fish with spearguns". In 1950, “Mondo Subacqueo” was released: a compendium, a summa, an encyclopaedia, but it looked exactly like a genuine periodical magazine. 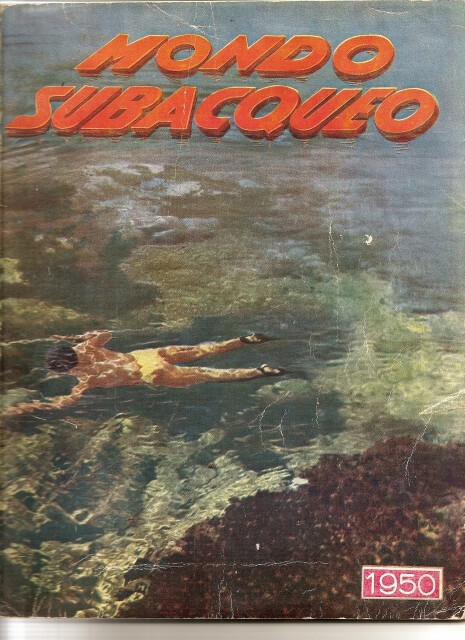 "Mondo Subacqueo", a single publication of over one hundred pages, with a cover price of 500 Lire, was released a year before the magazine "The Skin Diver" (subsequently renamed "Skin Diver Magazine"), founded by Jim Auxier and Chuck Blakeslee in 1951 and nine years before "Mondo Sommerso" (the first edition was issued in September 1959), which was edited in Rome by the cinematographer Goffredo Lombardo, who also produced "Gattopardo" by Visconti. The advertising pages in "Mondo Subacqueo" were representative of that pioneering age. Salvas - based in Rome at the time - was featured in it as a Public Limited Company dealing with Various Productions and Salvage Equipment and Pirelli, that was already offering "diving rebreathers and rubber wetsuits " for "nautical sports and underwater activities". A famous advertiser, Armando Testa, signed the page that Superga dedicated to its "fins for swimming". The magazine also featured Venturi (Recoveries at Great Depths), the company from Genoa where Ferraro made ends meet until 1947, Cressi, and the legendary Galeazzi from La Spezia that produced "equipment for underwater work carried out at any depth". The single publication of "Mondo Subacqueo" looked fascinating from the very start. 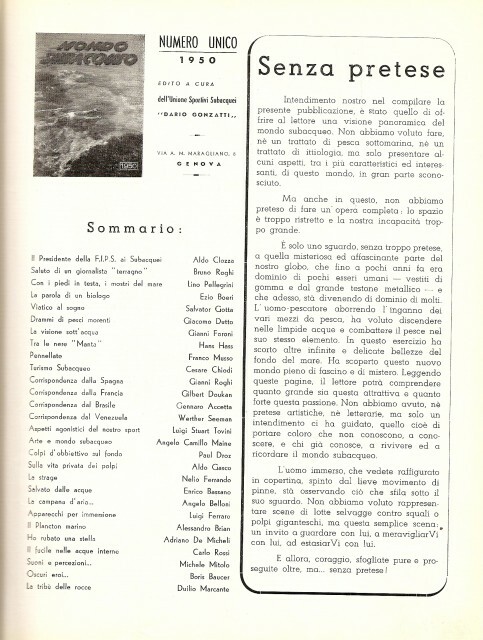 It included famous signatures such as: Bruno Roghi (writer of the article "Greetings by a worldly journalist"); Gianni Roghi, his son, who published the first correspondence from abroad dedicated to undersea sport; Lino Pellegrini who wrote about octopuses and Lyrics by Duilio Marcante "inspired by the memory of his friend Dario Gonzatti, who died in deep waters opposite the Portofino mountain". Salvator Gotta, a very famous writer, featured his "Viaticum for dreaming" in it. Then the signature of Hans Hass was featured at the end of an article describing the feelings of a diver equipped with a camera when he first met a manta ray in the Red Sea. Dr Gilbert Doukan, president of a French Club, wrote that undersea fishing started in France in 1936. The article was illustrated with photographs and captions that nowadays would be enough to send those represented straight to prison: "Dolphin hunting is popular among French sportsmen. Exciting sequence of the catch of a dolphin, harpooned in its element". Moreover, it referred to the state-of-the-art Gennaro Accetta from Brasil, Werther Seeman from Venezuela, Dionigi Lavatelli from Libya and Paul Droz. from Zurich. Gianni Foroni as skilled optician, delved in the issue of underwater vision, Professor Michele Mitolo discussed sounds and perceptions. In its one hundred pages, "Mondo subacqueo” covered all the knowledge that relates to the year 1950. The number of titles available on news-stands today is an indication of the level of popularity reached by specialised publications both in Italy and in the main European countries.